Summary: This compilation, based on teachings delivered by His Holiness in New York in 1999, is founded upon a weaving of two ancient Buddhist texts. These are made accessible here in part by Vreeland's skillful editing and in part by the unflagging style of the Dalai Lama, who continues to spread his message of loving compassion beyond the borders of Buddhism. Readers who savored his The Art of Happiness and Ethics for the New Millennium will likely be ready to take these next steps into practical approaches for everyday living that are supremely grounded in Buddhist philosophy, but extend an open heart to all types of believers and nonbelievers as well. While not a manual in the traditional Western sense of highly sequenced steps, this book is a treasury of teachings that point clearly to a better way to live. Exquisite, perfectly matched photographs round out such chapters as "The Desire for Happiness," "Karma," "Compassion," "Calm Abiding" and "Wisdom." Many books today receive the Dalai Lama's blessing, but this one issues a special invitation to receive ancient wisdom through the mind and heart of a modern spiritual master. An Open Heart is a fascinating book, with a message from one of the world’s greatest spiritual leaders that will reinvigorate the soul of its reader. It is for anyone who wants to explore the wonders of Buddhist mediation. 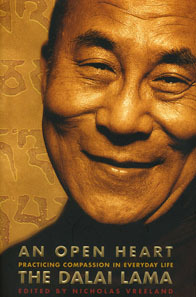 Moreover, it is for anyone who chooses to pursue the purpose of the book as defined by its title – to learn to open one’s own heart, to understand and attain true compassion, and to enter into an enlightened state of being that would change one’s own surroundings and circumstances on a global scale.